I've been reflecting on this image* quite a lot recently, finding new layers and depths of meaning each time I come to it anew. As an image it is quite simple, amazingly so: three brush-strokes, two colours - but such riches to be found within that simplicity! A cross, symbol of suffering, sacrifice and death, of torture and barbarity, hate and violence; of the love which impelled Jesus to accept his passion and death, and the love which, daily, impels so many others in smaller acts of sacrifice and self-gift. 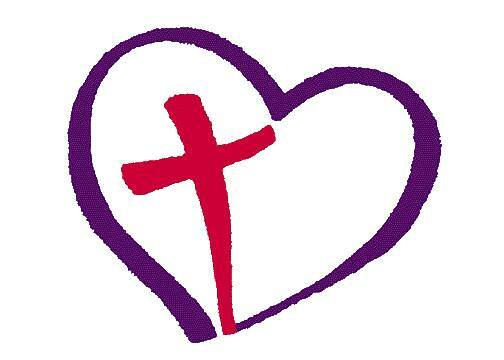 And a heart, universal symbol of love, and, for RSCJ, our entry point into Jesus, and into the depths of God. It contains the bare elements of the congregational logo I wear every day, and no doubt speaks to me, in all its simplicity, precisely because I am of the Heart of Jesus. I see Love - the Heart - flowing from the Cross; and I also see Love flowing into the Cross. I see Love embracing the Cross, and also containing it; suffering and pain somehow held within the Love from and into which they flow. I see the arms of the Cross thrust wide in welcome, and a sense of joy and exultation. And I see that the Cross doesn't hold a figure, because the Love which encompasses it is the figure, is Jesus, whose Love is larger than any Cross. I see space, plenty of space: like Julian of Norwich, I see a lovely and delightful place, spacious enough for everyone... to rest there in peace and love. And I see a small gap at the foot of the Cross, formed by the ever-open Heart; thus Love can flow out, just as we can all come in. Which do I see first, when I look at this image? I really cannot say. And if I were to draw it, where would I begin and end? I don't know. All I do know is that it speaks so powerfully of the Good Friday mystery we commemorate, and attempt to comprehend today. And you... What do you see...? * A friend used this image on social media a while back, and was able to trace it back to an old blog, but it's unclear where they got it from. If anyone knows who the artist is, please let me know.